This has got to be the most simple electronic project you can do. 1. Take the pen stopper or pen lid and cut a notch out of it to allow the light to shine out. The light bulb should just fit inside the pen stopper/pen lid. Alternatively you can make a tube out of card, cutting a notch in the tube for the light to shine out of. You will need to block on end to prevent light from escaping. If for any reason light is shining through the light shade rap tin foil around the top of the light. This will block the light. 2. Paint the light shade black or white and paint a straw metallic silver. Cut this straw to the desired length. 3. Solder the wires to the light. Push the bulb into the light shade and then thread the wires down the straw. You might need to paint the back of the light bulb the same colour as the shade once installed. 4. Drill a hole in your base board. this hole should be the same size as the straw at the top and halfway down the hole should be smaller. This will stop the light falling through the board and give it so support. 5. 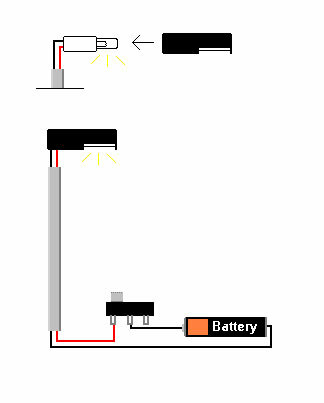 Connect the switch and battery and the light is finished. Use them on alternative sides of the street for best effect. 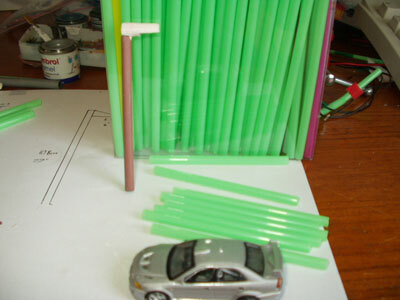 This is the easiest electronic project and very inexpensive. I have described the items I have used, these were items that I found around the house. You don't need to use the items I have used. This page only describes what I have done. Feel free to use the bits you like and improve on the bits you don't. I have joined two of the lights (using one straw) to make a double arm light.